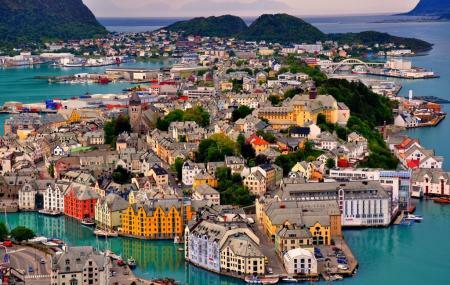 Find hotel near Alesund Town Park And Fje .. Built into the west side of Mount Aksla, the park is essentially just 418 steps that lead up the mountain to an unbeatable panoramic view of archipelago, the town centre, and the Sunnmøre Alps. You don’t have to walk up; you can drive, or even take the city train. At the top, you’ll find a café and a restaurant in addition to the viewing platform, which is called Fjellstoua. You’ll have to pay to use the toilet facility. The prices at the restaurant are very expensive. How popular is Alesund Town Park And Fjellstoua Viewpoint? People normally club together Alesund Museum and Alesund Harbor while planning their visit to Alesund Town Park And Fjellstoua Viewpoint.